If you want a hairstyle that is both stylish and professional, you’ll love slicked back hair. Men’s slick back hairstyles have been used throughout the years as a quick way to style a cool yet sophisticated look. The best part is that learning how to slick back your hair is easy, versatile, and can work with a number of different haircuts. From an undercut or fade on the sides to long, thick, or curly hair on top, the modern slick back haircut is worth trying in 2019. This guide will teach you everything you need to know about how to get slicked back hair. Swept back hair has a long history as a formal hairstyle. Because of its popularity, guys and barbers around the world have styled the cut in many ways. For example, in recent years, the slicked back undercut has been all the rage. Hipsters have loved the cut and style for its high-contrast, edgy look. Nevertheless, if you want faded sides, you may ask your barber for a slick back fade – low, high, or mid depending on how short you want the sides and back to look. Then you have the option of how short or long you want the hair on top to be. While we strongly recommend growing out your hair and going for a long slick back, this popular men’s hairstyle does support short hair as well. Ultimately, you can tailor the haircut any way you want as long as the hair on top is combed back. You can even choose to skip the sleek, shiny finish and apply a matte pomade or hair wax for a natural, textured style. After your haircut, the real challenge is learning how to train your hair to slick back. Most guy’s hair doesn’t naturally brush back, and if you have thick or curly hair, combing and keeping your hair back all day can be a problem.To solve this problem, you’ll need to use a good pomade or hair wax with a strong hold. Start by brushing your hair back in the shower. When applying shampoo and conditioner, use a comb to evenly distribute and style your hair back before washing out. Then, when you dry your hair in the mornings or at night before bed, towel-dry and consistently but gently pull it back. Feel free to blow dry on low-heat and use a wide-toothed comb or boar bristle brush to style the hairstyle you’ll want, even if you are planning to go to sleep. Gradually, your hair will start to adapt to the repetition. However, it is important to note that you won’t train your hair to go back in one morning. You’ll have to consistently style the look, apply product, and comb back your hair. But over time, your hair will naturally start to fall back. Curly hair is known to be difficult to tame. Luckily, the slicked back hairstyle is perfect for those with unruly waves or curls. In fact, curly hair that is slicked back actually gives a unique twist to the style. To slick back curly hair, follow these directions. Use a brush or comb to pull your hair back. Doing this after a shower or when your hair is slightly wet will work best. Apply a high-quality pomade or wax to your damp hair and work it in with your fingers and hands. Then start to comb the product through your hair to distribute it evenly. After, blow dry your hair back from the front of your hair. As you dry your hair, use a brush to pull your hair backwards and create a smooth surface. If you want a sleek shiny finish, comb your hair straight back. For a natural, textured brush back, don’t brush too hard as this could flatten your curls. You’ll want a little volume and the added texture your curly hair offers. While your curls will still be visible, by the time your hair is dry, it will stay back from your face in a textured but sleek hairstyle. Long slicked back hair has continued to be one of the best men’s hairstyles to get. As men with long hair know well, medium to longer hair lengths can be difficult to control and manage. Similarly, styling the sheer amount of hair on your head means spending a lot more time in front of the mirror – effort and hassle most guys don’t want. However, an easy solution may be to slick back your long hair. As a matter of fact, slicked back long hair is actually easier to style and maintain as the weight of your locks will keep the hairstyle held back and anchored. Again, make sure to utilize a brush and blow dryer simultaneously. Also we still recommend applying a light product for the perfect finish. If you’re growing longer hair and need a cool hairstyle that looks both professional and fun, ask your barber about the slick back. Now that you know how to manage different hair textures and lengths, let’s dive into some examples of the modern slick back haircut. The slicked back undercut is one of the top haircuts for men at the moment. With short, buzzed hair on the sides and back of the head and longer hair on top, undercut hairstyles offer flair and are easy to style. The slick back undercut plays on this attractive, high-contrast look, mixing formal and casual. 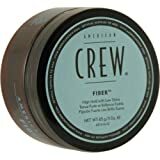 After leaving some length on top and getting the back and sides cut short to the same length, guys can comb back their hair and mix in styling product. The trendy final look is perfect for whatever occasion. The slick back fade combines the cool fading technique with brushed back hair. There are many different types of fade haircuts – low, mid, high, and bald – and the elements of each can make your hairstyle unique. Furthermore, the swept back top of this hairstyle requires length, so tapering the sides with a fade adds a modern twist to the transition between long and short hair. As one of the most commonly requested cuts, ask your barber if faded slicked back hair is right for you. The comb back is generally styled with more texture for a natural finish. Although much of the look is very similar to a slick back, combed back hair avoids the slick and shiny feel. 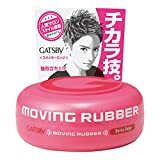 This way of styling men’s hair naturally has actually become a popular trend in 2019. To comb your hair back, use a brush or wide-toothed comb. Then apply a matte or low-shine pomade or wax. For a light, airy swept back hairstyle, be sure to lift as you pull your hair away from your face. Brushing your hair diagonally can give you a more angular, messy look. To properly slick back men’s hair and achieve a style that will last all day, you absolutely need the right products. All guys know that using the right tools can accomplish anything, and this applies to grooming and styling as well. Read about the features of each product, then decide which one is the most appropriate for your hair type and desired hairstyle. Pomade is the number one styling product for men who want to slick back their hair. It achieves the right balance between holding your hair back and not weighing it down. 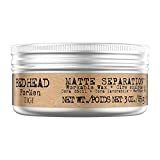 There are two different types of pomade: oil-based and water-based. Oil-based pomades are useful if you have dry hair and want a lot shine, but they are notoriously difficult to wash out. On the other hand, most consumers heavily prefer water-based pomades that offer much of the same hold and wash out easily with water. 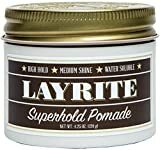 The best pomade brands manufacture a variety of holds and shines. For this hairstyle, we suggest a medium to high hold and shine. 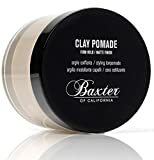 If you’re just brushing your hair back and want a textured look, try a matte finish pomade that will better preserve the natural texture of your hair. Here are the top pomades on the market! Wax is versatile and easier to apply. It has just one purpose: to hold your hair back. Unlike pomade, there is no risk of flattening your natural curls or losing volume when you use hair wax. On the downside, wax doesn’t give you as much shine. For those men who want to keep their hair back and looking natural without adding shine or weight, wax is the perfect styling product. Here are a few of the best hair waxes on the market. 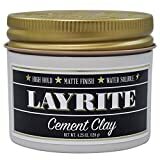 Clay has become popular as a barber’s tool for slicking back hair in recent years. If you have oily hair, clay is good because it will make your hair drier and give a natural texture. Care should always be taken to use it sparingly, as too much can actually dry out your hair and make it difficult to style into a slick back. Men naturally style their hair using their fingers to distribute products evenly. This is certainly the easiest way to move your hair around, although it can be messy. For a neat, smooth and slick finish, use a fine-tooth comb. Generally, the finer the teeth, the neater your slicked back hairstyle will appear. Towel dry your hair until it is damp. Apply product to your hair, distributing evenly through the longer sections. Comb your hair towards the back of your head. Either allow your hair to dry naturally for a looser slicked back look, or blow dry your style into place for added volume and hold. Once your hair is dry, decide whether you need to apply more product for a firmer hold. 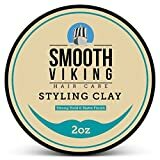 This is a personal choice depending on how long you want the slick back to stay in place and whether you want to keep the natural texture of your hair. Slicked back hair for men is a timeless look. Following these instructions will get you a trendy men’s hairstyle while training your hair to stay slicked back in place.